My son is constantly nagging me to complete the next item in his “midshipman wardrobe”, so I have been busy. 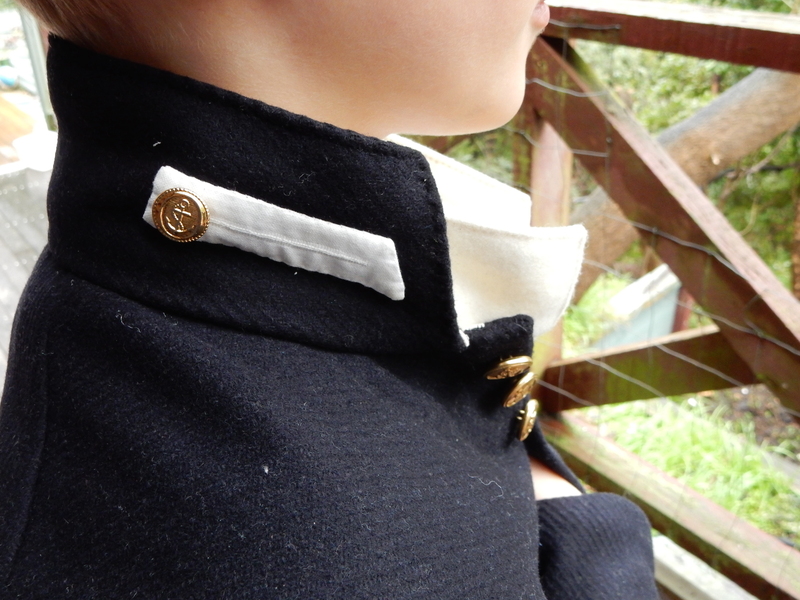 In my previous post, I made my-little-midshipman a shirt and stock. 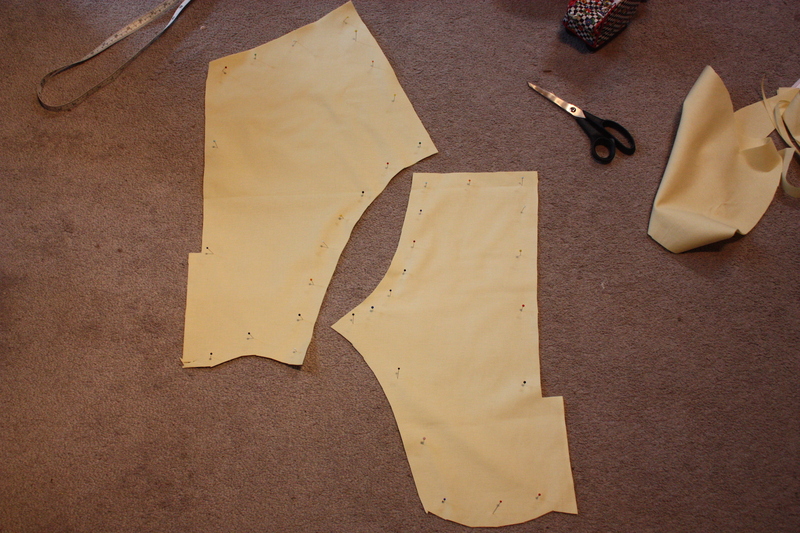 In this post I will be making a pair of breeches. 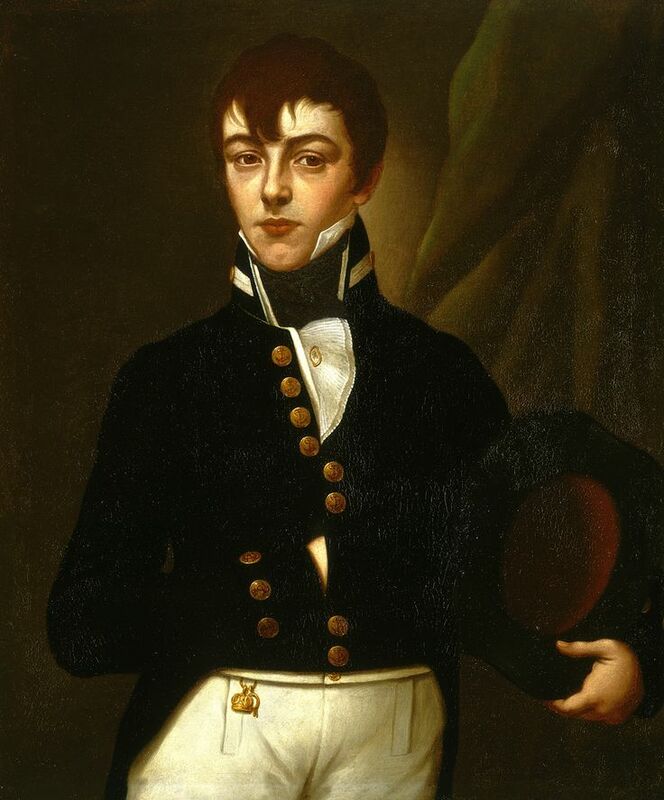 A midshipman of scant service depended for his authority on board largely on the force of his own personality. 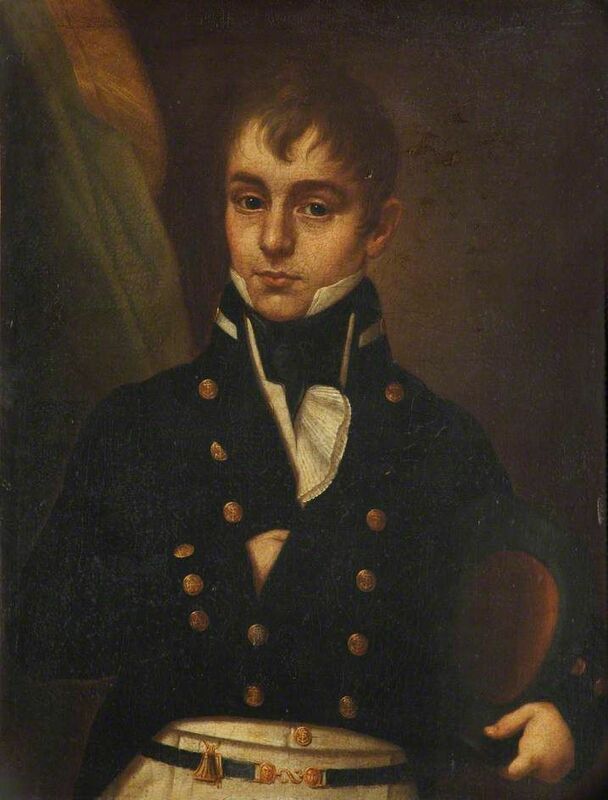 He was only a warrant officer himself; when all was said and done a midshipman was not nearly as important to the ship’s economy – and was far more easily replaced – than, say, Washburn, the cooper’s mate over there, who knew all about the making and storage of the ship’s water barrels. 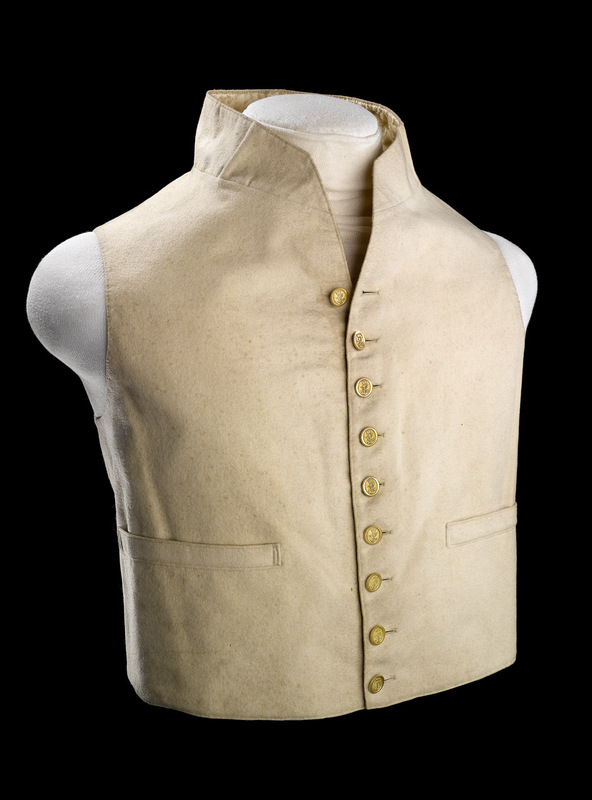 The Royal Naval breeches (1795 pattern) worn by Lord Nelson at the Battle of Trafalgar in 1805 (front view). 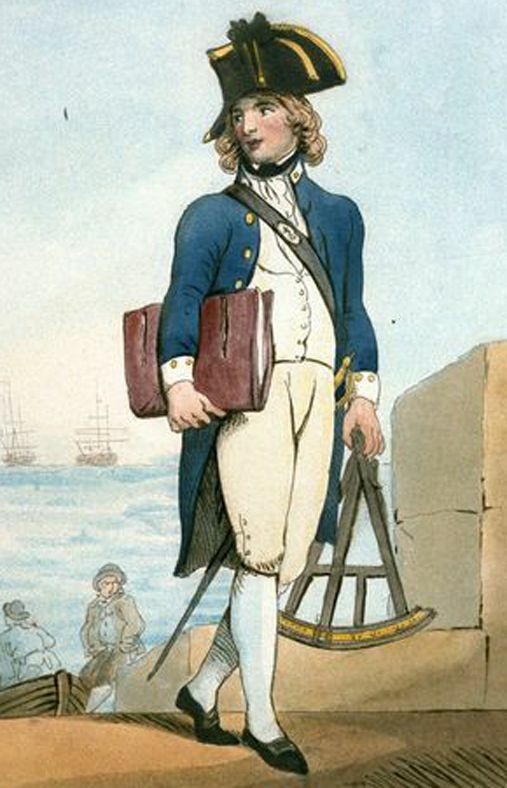 The Royal Naval breeches were very similar to all other breeches of this period. 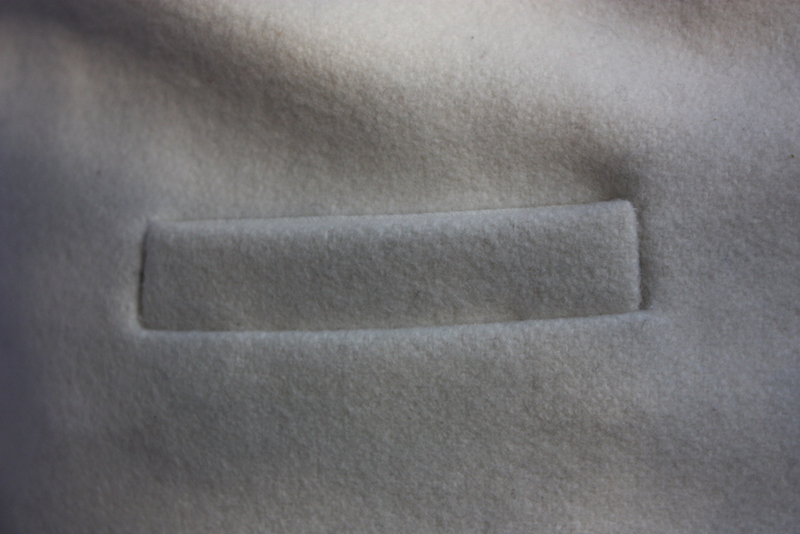 The waistband was thick and sat very high (compared to current fashion), and contained a small fob pocket in it. 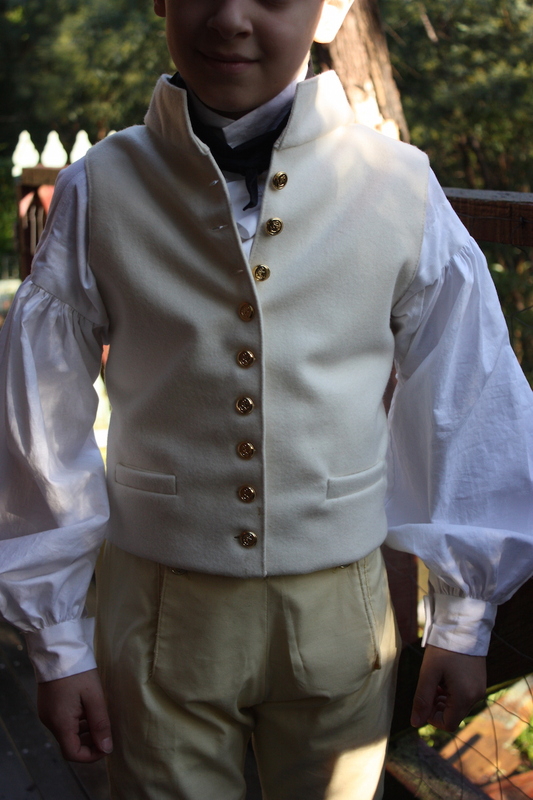 The breeches had a central fall front done up with buttons, and two “fall” pockets at either side also done up with buttons. The centre back waistband contained a triangular gusset with eyelets and a cord that laced up, providing an extra means of adjustment. 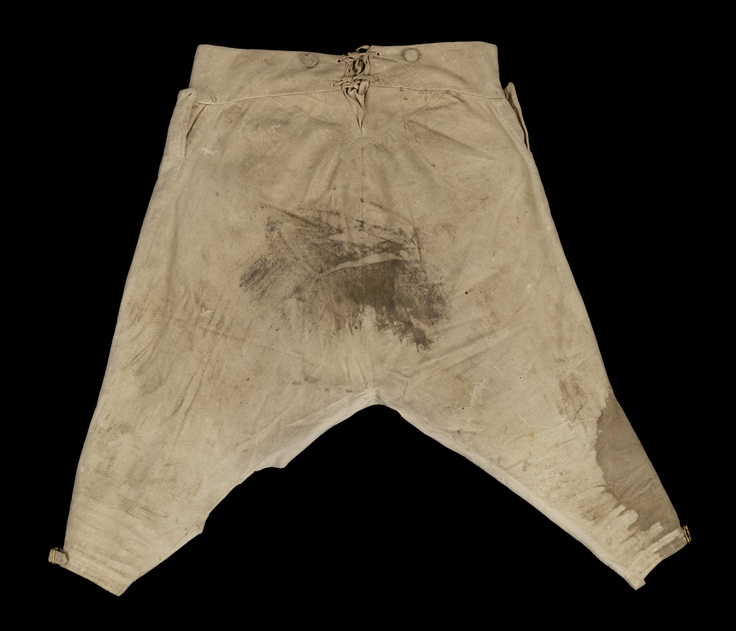 The back view of Lord Nelson’s breeches, worn in 1805. 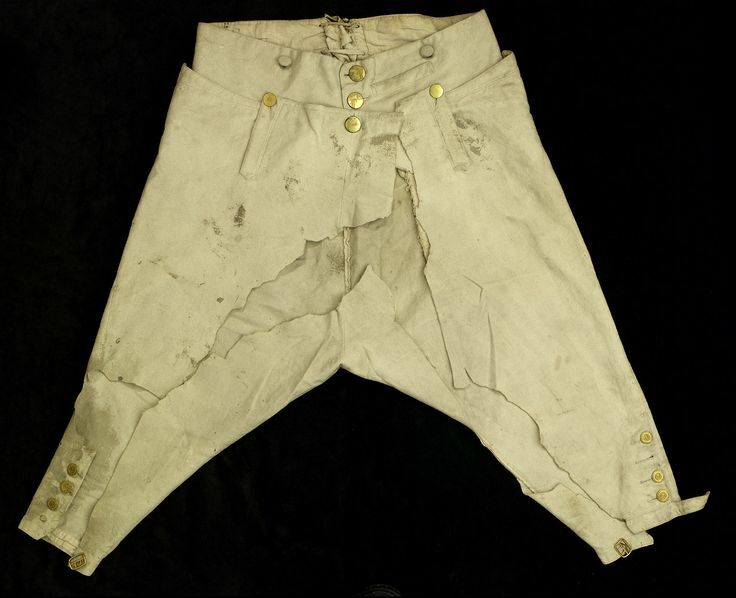 In contrast to the “normal” breeches of this period, Royal Naval breeches were always made of white material, such as woven wool. 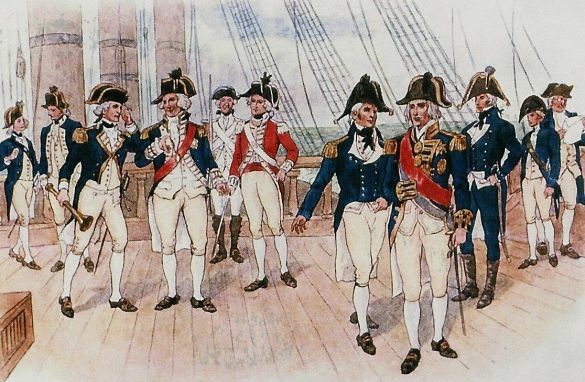 The breeches reached to the knee, as they all did during that time, and were fastened with four Royal Navy brass buttons, as well as a brass buckle. 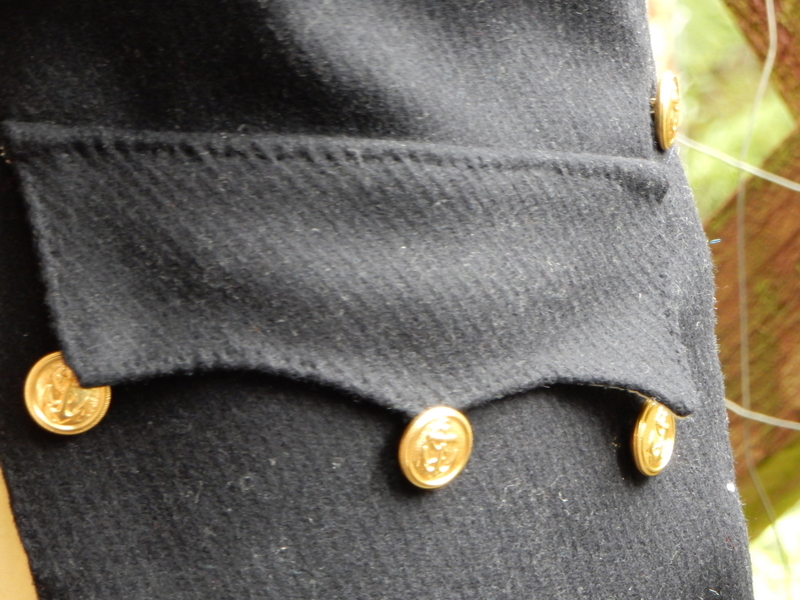 Navy breeches also seemed to routinely have four extra buttons around the top of the waistband for the use of braces. 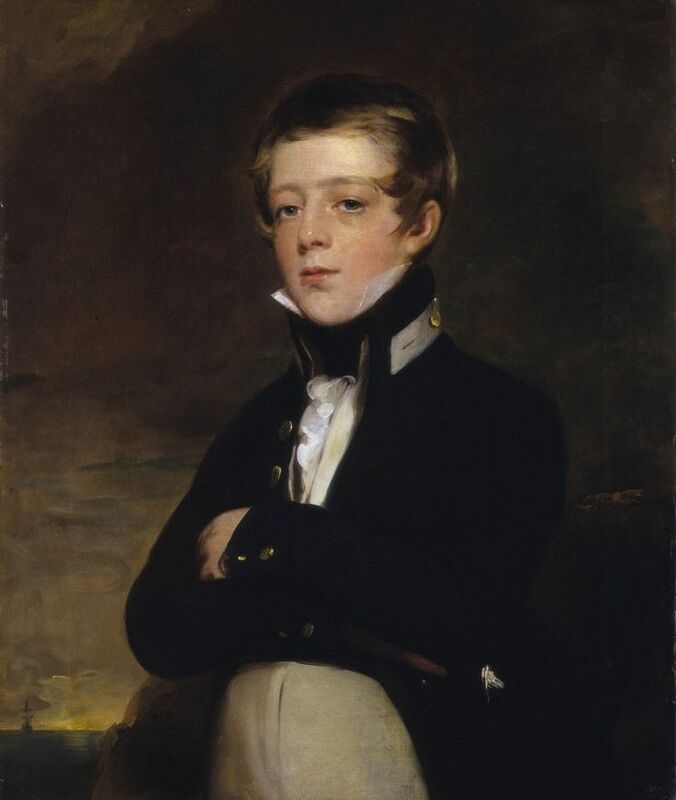 Hornblower poked forward his padded leg, pointed his toe, laid his hand on his heart and bowed with all the depth the tightness of his breeches allowed – he had still been growing when he bought them on joining the Indefatigable. Knowing these measurements helped me change the size of the pattern pieces. I often mark the material by sticking pins vertically into the carpet so that I can stand back and look at the shape of the pattern pieces as I go. 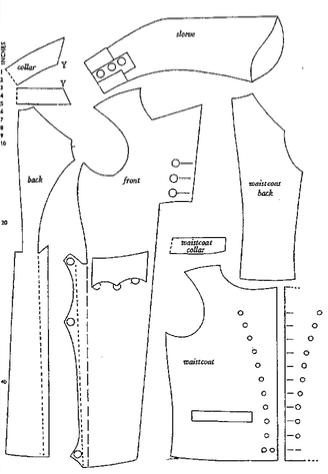 It is important that the pieces correspond to the measurements, but it is also important that the pattern pieces retain the same overall shape, as it is the pattern shapes which form the characteristics of any garment. 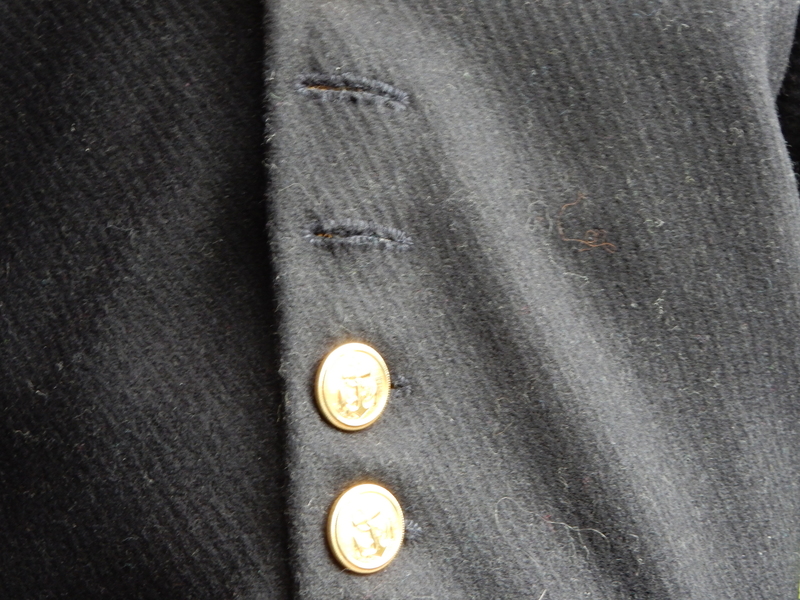 Using pins in this manner makes it easy to change the pieces as I remeasure and compare to the original pattern piece. In hindsight, it might have been good to copy this “pattern” onto a sheet of paper to use again! 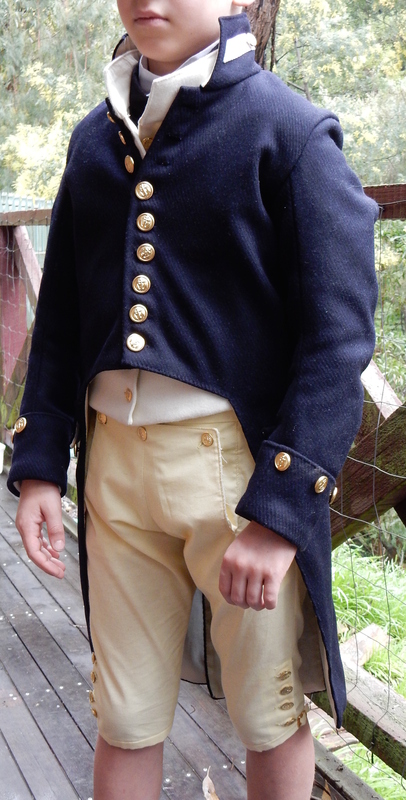 The breeches back and front marked with pins and cut out. Once this had been fitted, I did need to take a large wedge out of the centre back seam for it to fit properly. 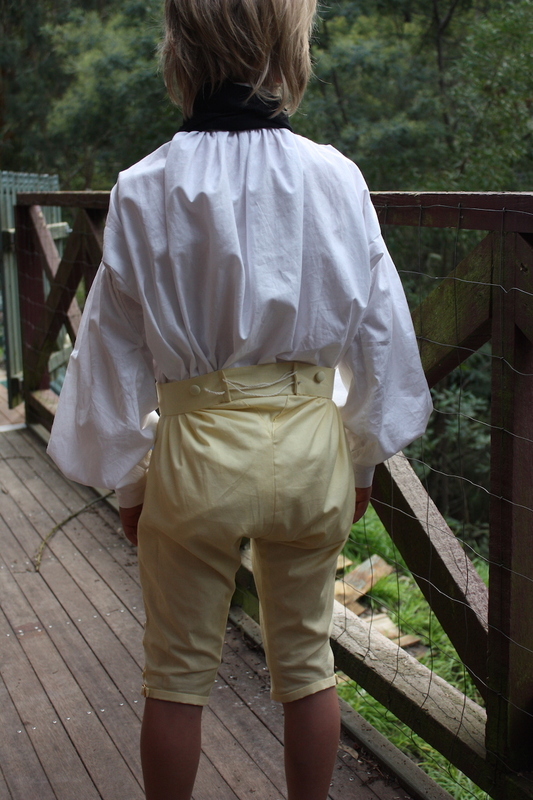 I used a lemon coloured cotton broadcloth (surely white breeches did not stay white for long!! 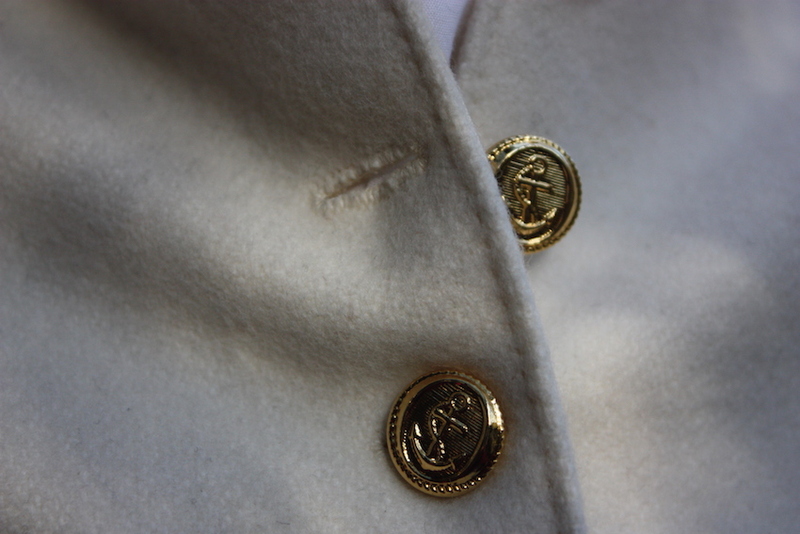 ), with small gold-coloured metal buttons. I made several changes to the pattern, as I did for my husband’s pair. 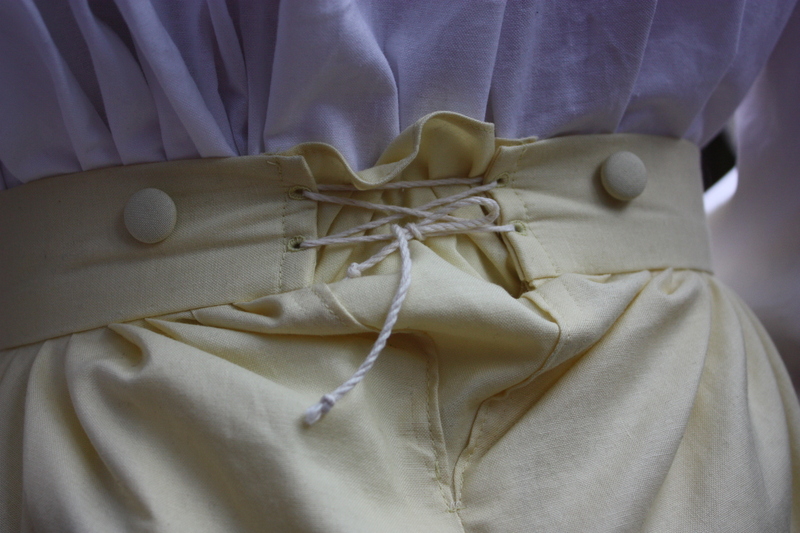 I added a triangular gusset to the centre back of the waistband, with some eyelets and cord to lace them up. 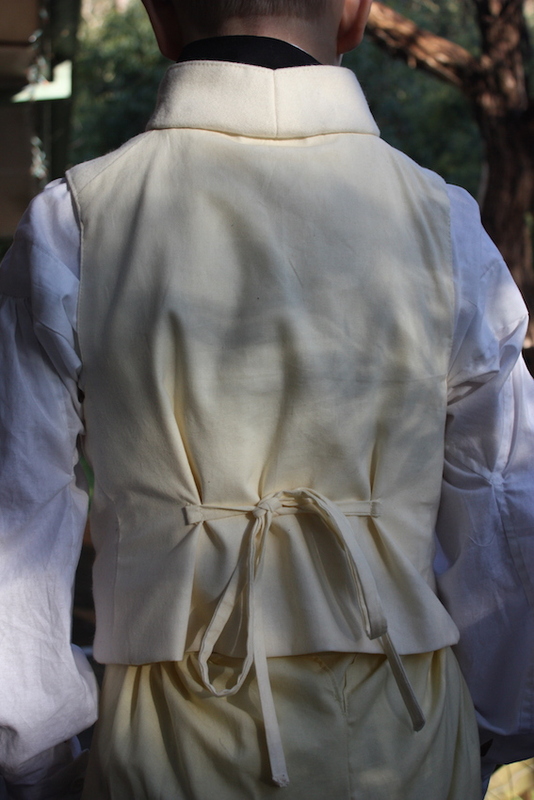 The back triangular gusset in the centre back, laced with cotton cording. 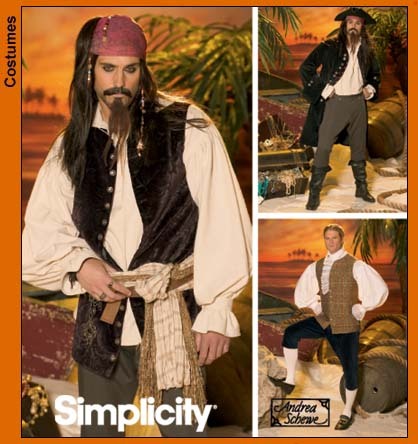 You can see the buttons added for the use of braces. Instead of using bias binding to hem the bottom under-knee edge, I attached a narrow cuff, leaving some overhang to use with a buckle. 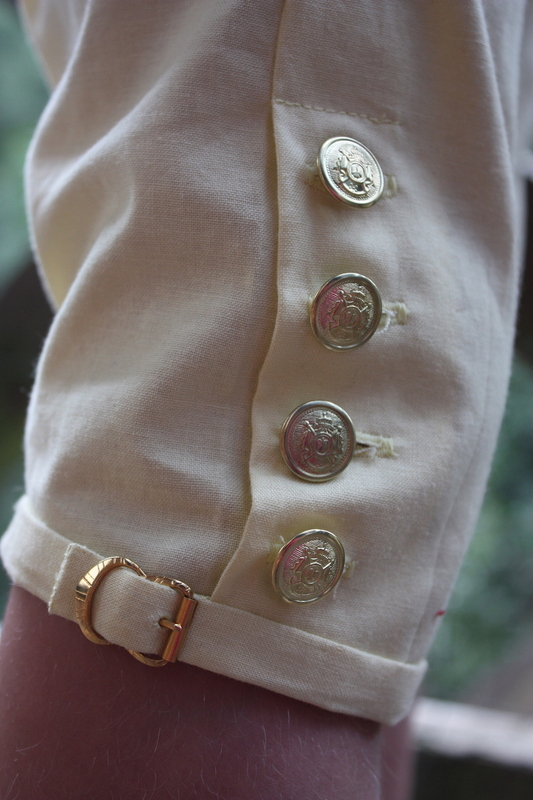 The knee buttons and buckle. 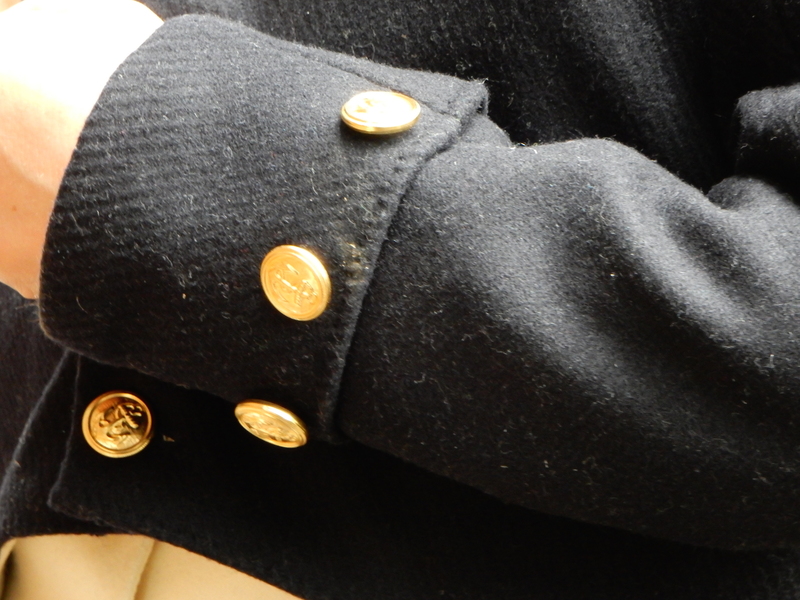 The buttons are not the navy buttons normally seen during this era, but I had limited gold buttons to choose from! 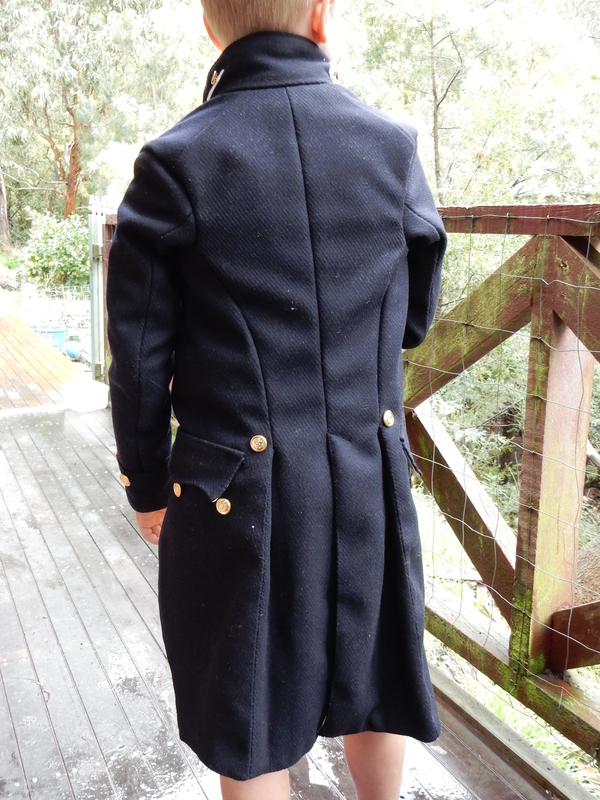 The back view, without the lacing done up properly (oops!). 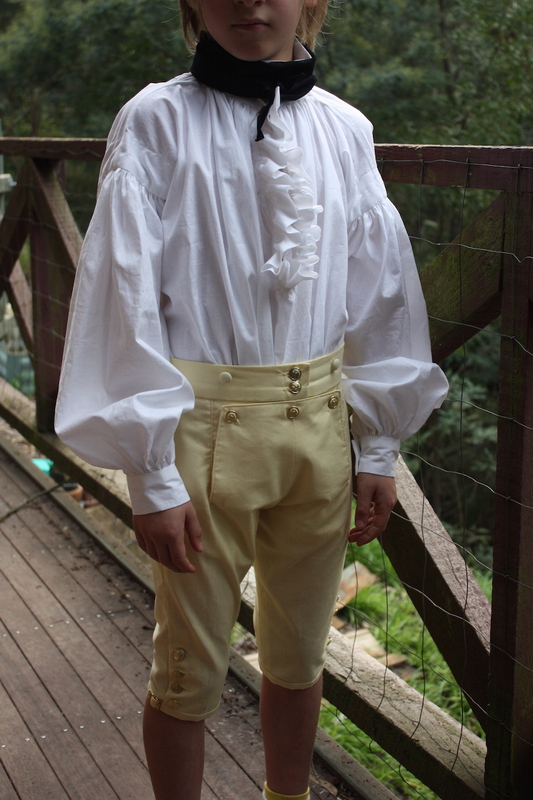 These breeches have turned out quite well, I think. They fit nicely, with enough room for some growing. I would like to make a second pair with ivory cotton broadcloth, as I wonder if the lemon ones might be a bit too yellow. I would also like to try and alter the pattern to include the two side “fall” pockets that are so often found in the originals. At this stage I have not put the small fob pocket in the waistband either. 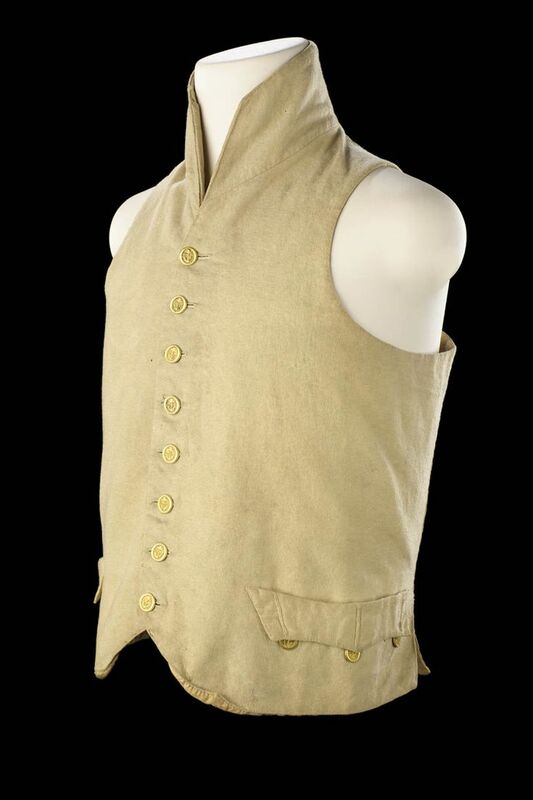 But for now, I am moving on to the waistcoat! 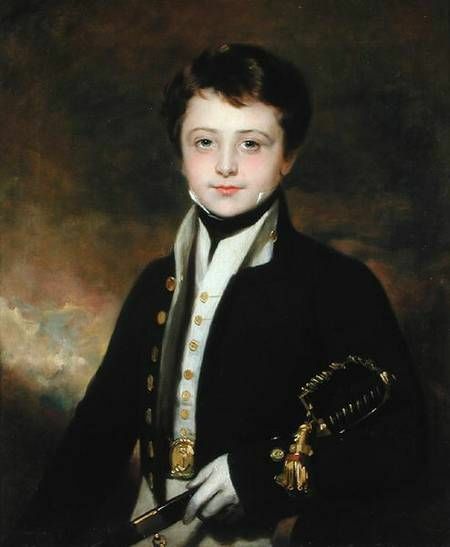 To read more about The Making of a Midshipman, go to My Regency Journey.